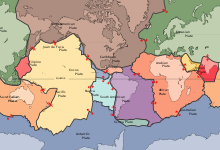 Due to continental drift, the India Plate split from Madagascar and collided with the Eurasian Plate resulting in the formation of the Himalayas. The collision of India and Asia (90 mya — present), by Christopher R. Scotese, from the Paleomap Project. Retrieved December 28, 2004. Magnitude 9.0 off W coast of northern Sumatra Sunday, December 26, 2004 at 00:58:49 UTC: Preliminary earthquake report[স্থায়ীভাবে অকার্যকর সংযোগ], from the U.S. Geological Survey. Retrieved December 28, 2004.